Contemporary culture has traditional roots. 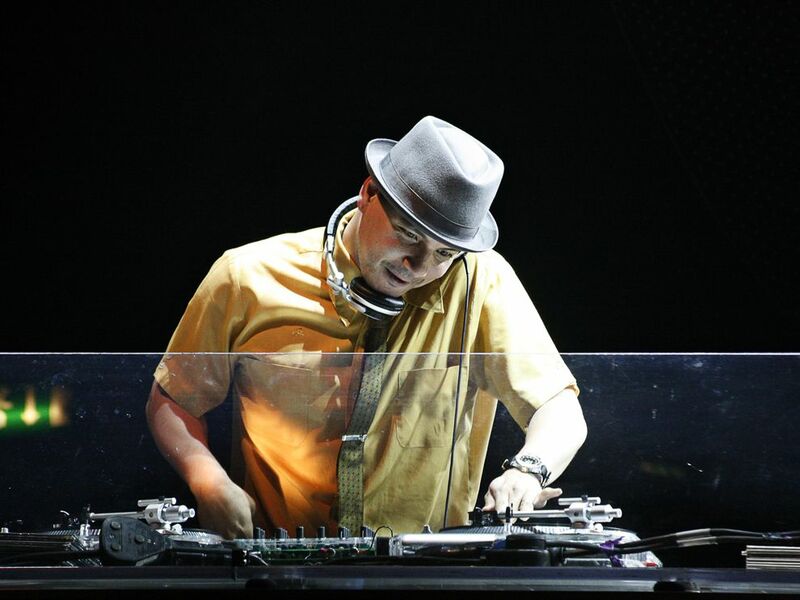 Michael Schwartz, popularly known as Mix Master Mike, is a turntablist and musician. He was a founding member of the innovative group Invisibl Skratch Piklz and is now a member of the Beastie Boys. May is Asian Pacific American Heritage Month. Filipino Americans are the second-largest group of people with Asian ancestry. (Chinese Americans have a larger population.) Ancestors of Filipino Americans come from the Philippines, a group of islands in the South Pacific Ocean. Filipino American identity has been connected to hip-hop culture for many years. Filipino hip-hop includes mobile DJs, turntablism, and Pilipino Culture Nights (PCNs). The Philippines was a colony of the United States from 1898 to 1946. American culture had a profound impact on that country, influencing government, social institutions, and musical tastes. Disco, funk, and Motown soul music, popular on American military bases, found their way onto local radio stations. Eventually, so did rap. Filipino Americans were some of the first people to experiment with mobile DJ crews in the 1960s and 1970s. Disc jockeys, or DJs, were responsible for providing the music at clubs, parties, and other social events. "The film Saturday Night Fever made it trendy to go to a disco," says Dr. Oliver Wang, assistant professor of sociology at California State University, Long Beach. Wang is an expert on the Filipino American mobile DJ community. "People were exposed to a glamorous nightclub culture, with the DJs providing the technical wizardry,” Wang said. “Kids too young to go to a traditional nightclub started to copy the disco experience by DJing in a garage, or a gym, or a church hall." By the 1980s, some mobile DJ crews started to experiment with new music technology. Faders let the DJ switch the music from one turntable to the other, allowing them to play two different records at the same time. Another technique involved breaking up the music by switching the position of the needle on the record. This switching back and forth between beats and melodies on different records was called beat juggling. DJs who specialized in this new music technique were called scratch DJs. Scratch DJs used the record turntable to make music, blending two different records into one new, totally different sound. The turntable was their musical instrument, much as a guitar or drums are in a traditional band. This new art form was called turntablism. Groundbreaking turntablists of the 1980s and 1990s included Los Angeles’s World Famous Beat Junkies and the 5th Platoon, from Queens, New York. One of the most influential turntable bands was the Invisibl Skratch Piklz from the San Francisco Bay Area. In the early 1990s, they won the International Disco Mix Club (DMC) competition three years in a row. They had so thoroughly dominated the DMC that in their fourth year, they were asked to be judges instead of contestants. The Invisibl Skratch Piklz broke up in 2000. "Turntablists model themselves after bebop jazz musicians like Miles Davis and Dizzy Gillespie," said Dr. Elizabeth Pisares, a writer and expert on contemporary Filipino American culture. "DJ Qbert [a member of the Invisibl Skratch Piklz] is often compared to [jazz musician] Charlie Parker by other musicians for his particular style and range. This allows [turntablists] to be recognized by other musicians. Tom Morello of Rage Against the Machine often mimics the sound a turntable makes with his guitar. Morello and Buckethead list DJ Qbert as an influence on their music." To Pisares, it is no surprise that many of the most well-known scratch DJs and turntablists are Filipino Americans. "Many Filipino Americans experience a kind of social invisibility," she said. "The Philippines were ruled by the Spanish for over 400 years before the country was handed over to the U.S. in 1898. Filipino Americans look Asian, but have Spanish last names. Most Filipinos arrived in the U.S. knowing how to speak English, as it was the official language in the Philippines." As a result, many Filipinos are mistaken as having other racial and ethnic backgrounds. "How do you create your own identity when other people don't see it or refuse to recognize it?" asks Pisares. "We are hard-wired to express ourselves. Filipino Americans are very good at taking cultural materials and reordering them to find their own identity. Turntablism is just one example of taking the condition of social invisibility and turning it to their advantage." Filipino Americans celebrate their unique heritage through Filipino (or Pilipino) Culture Nights (PCNs). "The PCN got its start in the late 1970s and early 1980s on college campuses in San Francisco and Los Angeles, where there are large populations of Filipino American students," said Dr. Theodore Gonzalves, associate professor of American Studies at the University of Hawai'i at Manoa and an expert on Filipino Culture Nights. "PCNs are an important part of college life for Filipino American college students at schools such as California State University, San Francisco State, Santa Clara University, and all the University of California college campuses." A PCN is divided into two main parts. The first part is the performance of traditional folk material. This could include music and dancing. The second part is a skit about Filipino life in the United States. Each part is made up of several suites, or acts, where different cultural regions of the Philippines are represented. PCNs feature traditional Filipino instruments like bamboo flutes, bandurrias (similar to guitars), and gongs, being played alongside turntables, guitars, and keyboards. "PCNs are all about expressing yourself in a safe cultural space," said Gonzalves. "They are about slowing down time to experience history on their own terms. A skit may take a defining moment, like the labor strikes of the 1930s, and act it out. Students often will embody gods and goddesses from Filipino legends. Through their bodies, they're physically connected to the history of the Philippines. PCNs are performed for themselves, their friends, and their families as a way to celebrate being a Filipino American." Michael Schwartz is from the San Francisco Bay Area. The Debut is a movie about Ben Mercado, a Filipino American teenager. He wants to go to art school, but his father wants him to put away his dreams and become a doctor. The conflict erupts at his sister's birthday party, where Ben has to make some important decisions. The film has scenes of mobile DJ crews, turntablism, and PCNs. Read more about the move at the Internet Movie Database. Apl.de.ap of the Black Eyed Peas, Cassie Ventura, and Chad Hugo of the Neptunes and N.E.R.D. are contemporary Filipino American hip-hop artists. In 1542, the explorer Ruy Lopez de Villalobos explored islands in the South Pacific. Lopez de Villalobos claimed the islands for Spain, and named them Las Islas Filipinas, after the Spanish king, Felipe II. The people who were living on the islands were all called Filipinos, although they spoke many different languages and had many different cultures. In 1898, the United States took control of the Filipinas. In English, Felipe is Phillip. (Felipe II is known as Phillip II in most English-language textbooks.) The United States renamed the group of islands the Philippines. However, the people remained Filipinos. The Philippines became an independent nation in 1946. Filipino is the national language. (May) time to honor and celebrate the achievements and identity of Asian Americans. ability of a DJ to switch back and forth between different records at the same time. (1920-1955) American jazz saxophonist and composer. physical space, including the buildings and classrooms, of a college or university. place or society where behaviors are learned, such as language, belief systems, and social structures. style of music popular for dancing. (1917-1993) American jazz trumpeter and composer. (disc jockey) person who selects and plays recorded music for an audience. (1969-present) American turntablist and composer. tool used to gradually lower the volume from one device while raising the volume on another. style of music or art based on peasant or traditional culture. having to do with a consistent characteristic or pattern of behavior. musical style involving rap and DJs controlling multiple turntables. how a person defines themselves, or how others define them. (1926-1991) American jazz trumpeter and composer. facility owned and operated by a branch of the military. musician who attends parties and other social events in order to provide music. small, thin instrument that can transmit vibrations from a groove in a record to make them able to be heard as different musical tones. (1527-1598) Spanish king. Also called Felipe II. series of performances celebrating Filipino American identity, popular at college campuses. musician who manipulates the position of the needle on two or more turntables to create new music from two or more albums. short play or comic act. situation of a person or group being ignored by other people or groups. situation of people refusing to work in order to call attention to their working conditions. sections or acts of a musical performance. having to do with the latest styles or trends. circular platform that spins a record album. art of using one or more record turntables to create music.